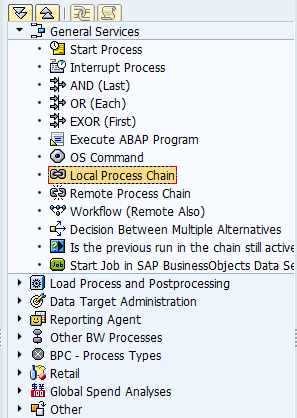 Process chains (PC) are very commonly used to automate data loading activities and other tasks in BW. All activities carried out by the PC are referred as process within the PC. One PC can be included as a process in other PC. The PC which has as step/process other PC is called metachain. The PC which is included in met chain is referred as local PC. There is a process type called "Local Process Chain" within "General services" dedicated for process chains. A usual question which is raised while talking about Local Process Chains is what are metachains where the local one is included. Or in other words a process chain where used type of thing. So how to find out this? All is available in table RSPCCHAIN - a directory of the entire PCs. Meta chains are having value CHAIN populated in field TYPE which identifies Local Process Chain. Now when we display entries of the same table just for Local Process Chain (GYEA_*) = VARIANTE with further filter on field TYPE = CHAIN we got a list of all metachains where it is used.